Turning the clock back 40 years, Japan played a crucial role in giving Australia a leg-up toward becoming a player in the global movie industry. In late 1977, a couple of fledgling Australian filmmakers pooled their meager funds and shot a movie starring mostly unknown young actors and actual motorcycle gang members serving as extras. Almost two years later, Mad Max opened Australian theaters and became a steady, but controversial hit. The car action movie was immediately banned in New Zealand as some of its motorcycle gang violence resembled actual events in the market most closely resembling Australia’s. Australia’s movie industry was in the middle of a growing renaissance, backed by a generous government funding program and the emergence of a large number of talented directors and actors. Mad Max was made for a mere pittance in movie terms, costing just $350,000. 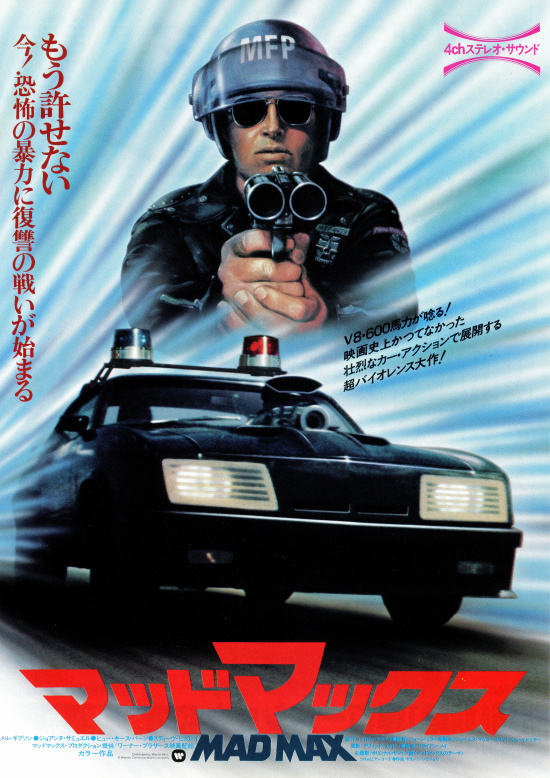 Backed by the steady performance at the Australian box office, the movie’s first overseas sale was made to Japan, then a country where bosozoku motorcycle gangs were having their heyday. Mad Max became a massive hit in the world’s second-largest movie market. This Big in Japan success made overseas sales a much easier task and the movie was sold widely across the globe. It would be a slow burner that flared following the phenomenal success of its first sequel, Mad Max 2, released in 1981. The box office for Mad Max would eventually surpass $100 million and for more than two decades it would hold the world record for the greatest ratio between production cost and box office. These sales led to a sequel and opened the door for the actor in the title role,Mel Gibson, to become a global superstar (until he destroyed his career a quarter of a century later in a drunken rant about Jews followed by enraged verbal and allegedly physical attacks on the mother of his youngest child). Further sequels, Mad Max: Beyond Thunderdome, which came out in 1985, and 2015’s Mad Max: Fury Road with Briton Tom Hardy playing the titular character. Mad Max created an enormous legacy that went much further than the sequels and Gibson turning into a Hollywood superstar. The effects were particularly strong in terms of Australia-Japan collaborations. The movie itself benefited greatly from Kawasaki, which donated all the motorcycles used in the film. But there was much more. 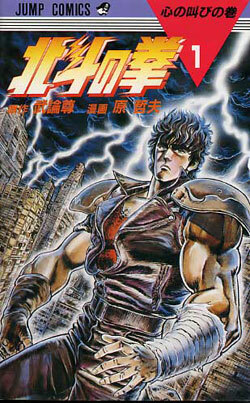 Drawing heavily from the Mad Max saga, the enduring Fist of the North Star would become one of Japan’s most successful manga in the 1980s and made stars of its writer, Buronsanand illustrator, Tetsuo Hara. Akira Kushida would get one of his early hits with Rollin’ into the Night, which played over the end credits of the Japanese version of the movie. 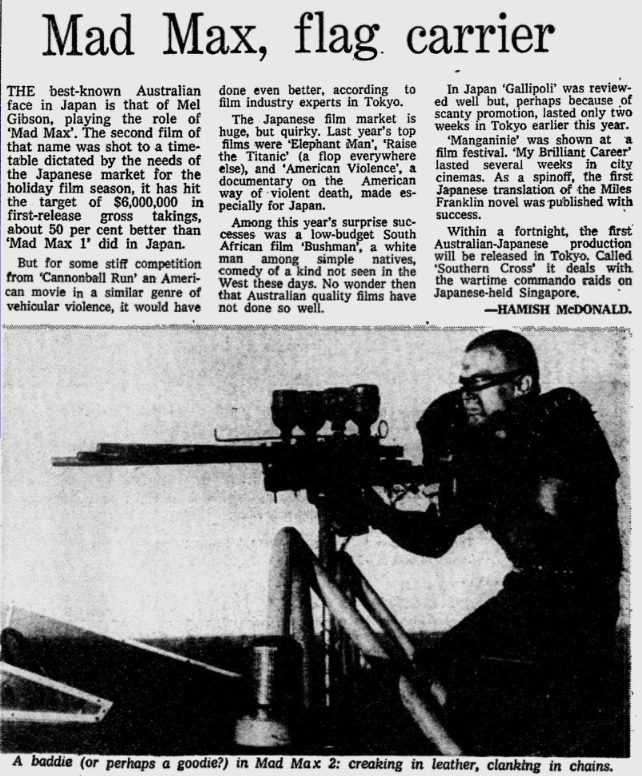 As noted in the accompanying newspaper article from the May 10, 1982, edition of the Melbourne Age, the success of the early editions in the series would spark joint movie production efforts between Japan and Australia. The article mentions a movie under production and entitled “The Southern Cross.” The first-ever joint Australia-Japan feature film collaboration would eventually come out later in 1982 with the new English title of The Highest Honor (it would remain under its original title in Japanese). That movie was quickly forgotten, but it is notable for being the debut movie of Hitomi Kuroki, still one of Japan’s most successful actresses to this day.